There are tons of Android apps that allow you to manage your phone and back up your data to the cloud; however, if you still prefer the old school way of syncing your phone to your computer, then MoboRobo could be a useful app for you. MoboRobo is an Android Manager for your PC (Windows only) that lets you manage all the things you have on your device right from your computer. It comes with a number of features pre-installed. From managing texts to backing up your device, you have an option in the app to get your task done. If you have just switched from iOS to Android and are wondering how you can transfer your contacts from iOS to Android, the MoboRobo tool can help you do that. With a few clicks, all your contacts will be moved to your new device. And if you plan to go back to the iOS, you can use the same tool to have your contacts copied to your older device again. It makes your job much easier and faster than doing it manually. No matter how secure your phone is, you should have a backup of it saved in your PC. 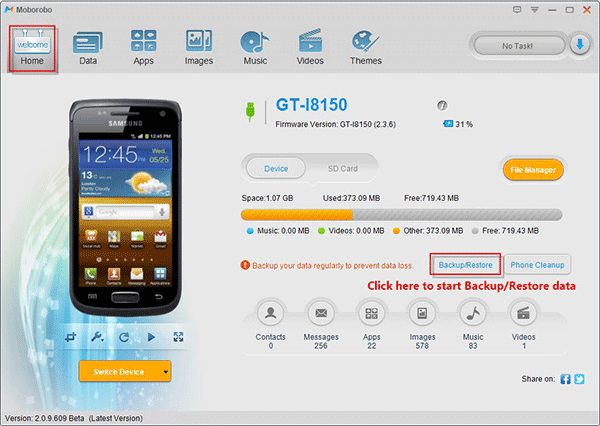 In case your phone gets corrupted, you can easily restore the backup and have all of your data back on your device. With MoboRobo, you can create backups of your device with a few clicks and save them right on your PC. You can then take the plunge and experiment with the apps you thought would wipe off the data on your device. If some unexpected things happen, hit “Restore” and get all your data and settings back. It is always a good idea to keep your media files organized, so the next time you want to listen to your favorite music, you can find it easily. 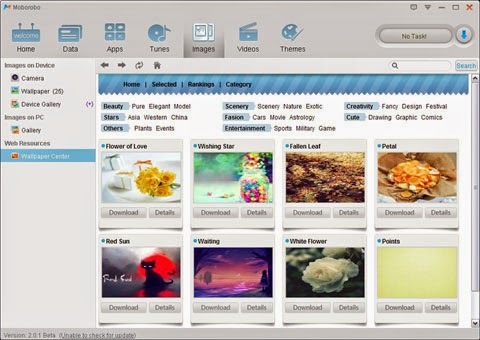 MoboRobo has tabs for various types of multimedia files you have on your device. For instance, you can find all the images on your device by going to the “Image” tab. Similarly, you can do other tasks by simply clicking the appropriate buttons. It also supports drag-and-drop so you can easily add new files to your library by simply dragging them from your PC and dropping them off in the tool. I know it’s quite hard to type messages, especially long messages, on a touch screen where you are prone to making spelling and other mistakes. MoboRobo lets you send and reply to messages right from your PC. That way you can use the keyboard of your computer to type your message, hit the “Send” button and have it sent to the intended recipient. 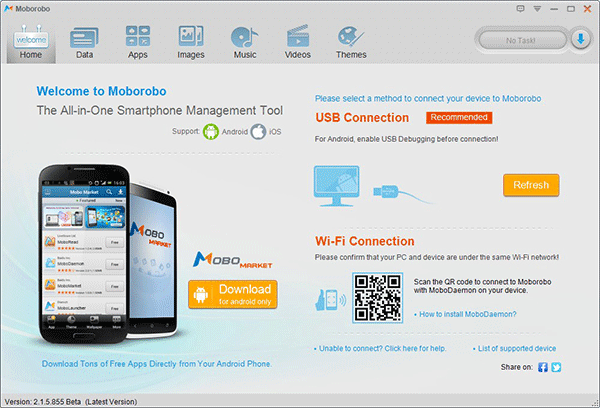 Should you ever need to take a screenshot of your device, you can simply use the MoboRobo tool to do so. 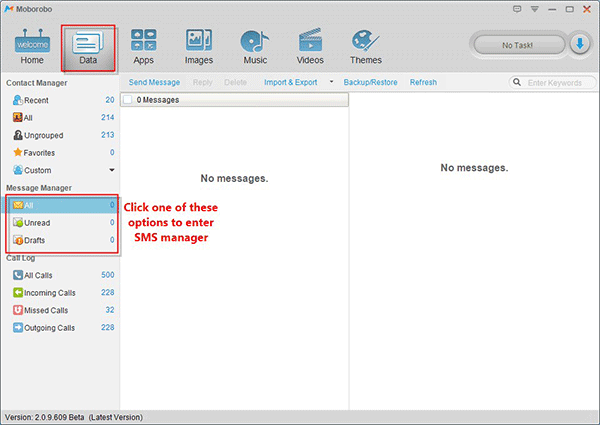 The inbuilt option allows you to capture the portion of your device and save it as an image file on your device. You can then share it with your friends or just have it saved on your device. The app manager allows you to install and remove apps from your device right from your PC. If there are a number of apps installed on your device and you wish to remove them from your device using your PC, MoboRobo is there to help you out. Will We Not Have to Charge Devices in the Future?